If you missed our first post on the subject, we're doing a series of giveaways for our readers this December. That means that every week this month, we'll be giving an impressive piece of cooking equipment to one of our subscribers (which could be you!). Last week, one lucky entrant won an Instant Pot, the versatile multi-cooker that's built a huge fan base among home cooks. 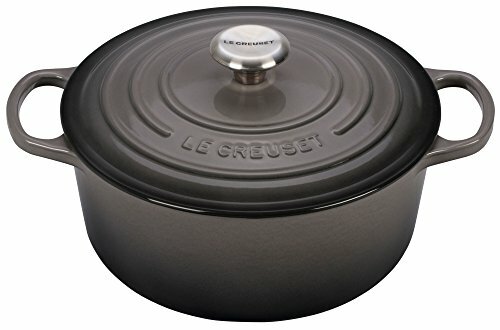 Next up in our giveaway: a classic Le Creuset Dutch Oven. * Our standard contest rules apply. Please note that by entering the giveaway, you are consenting to be added to the Serious Eats newsletter mailing list. So sign on up, spread the word to your friends and family, and get excited for the clock to strike midnight on Friday. In the meantime, if you haven't already, be sure to check out our holiday gift guide to get our gift recommendations for all the culinarily minded folks in your circle. Each week in December, we'll be giving away one of our top-rated pieces of equipment. To qualify, all you need to do is enter your email. View our contest rules. Email addresses will be added to the Serious Eats newsletter mailing list. You must resubmit your email each week to qualify, even if you are already subscribed. And if you don't happen to win this week, don't worry: Next week, we'll be doing it all over again.